The Catholic Message Board • View topic - "Call no Man Father"
Post subject: Re: "Call no Man Father"
To the OP, I've given up on discussing this very issue with my fundamentalist friends. One is an incredibly intelligent woman, who is agile and flexible on any matter except her religion. Which she advocates with an endless series of biblical quotations. When such a topic arises, I can see the glaze appear in her eyes, her voice rises, and she begins quoting verse after verse...and substantiates their literal authority by saying that the Bible is the Word of God and cannot be abridged, related, interpreted, colored, considered, contextualized (see how that word plays per the above) except as literal. Oh, and when I used to point out an inherent contradiction in verses, she rolls her eyes and replies something like, "Well, of course the real meaning of the verses removes any contradiction." Fruitless. It is as if the Bible consists of a collection of very large number (∞) of randomly independent verses by different authors who have no connection to each other or to any overarching thread. So, I avoid Biblical discussion (wrong word -- listening to an endless, repetitive monologue is more accurate) with her and her ilk. No, Denise Dee, you are simply wrong here. You are conflating two distinct usages of ‘literal,’ one pertaining to the exact meaning of individual words, the other pertaining to the interpretation of texts. The literal meaning of ‘pull’ and ‘leg’ is ‘drag’ and ‘lower appendage.’ But the literal interpretation of “you are pulling my leg” is not “you are dragging my lower appendage” but “you are joking [with me].” Because when we literally interpret a text, we are interpreting the text as a whole, and looking for its meaning. That is what literal interpretation means. This is textual, and not just biblical, interpretation 101. Doom is speaking of the interpretation of a phrase used in a text or in a conversation and you maintain, wrongly, that literal interpretation is about interpreting each word individually, out of context. That is not now, and has never been, the case. If there were only one "literal" meaning, there would be no thesauri. Or brontosauri. And the word "synonym" would be bereft of meaning. Plus "in other words" would not be much used. Doom is speaking of the interpretation of a phrase used in a text or in a conversation and you maintain, wrongly, that literal interpretation is about interpreting each word individually, out of context. That is not now and has never been, the case. That is a good explanation. In the realm of "for what it's worth," the older sense of "literal interpretation" Doom, CC, and others are using is conveyed in the literature I've ready over the years by the term "primary meaning." The term "literal", especially sense Frege, has so many nuances in so many cases that it's all but useless. It is argued, for instance, that if I point to someone and say, "He is thirsty," and the person really is thirsty in the ordinary sense, my words still are not "literal" because "literal" is to be understood as meaning derived exclusively from the conventions of the particular language. So "he" in English is a demonstrative pronoun that does not, by convention, refer to any particular person. So you need further distinctions, because no one would really want to say that "he is literal" is then in some sense figurative. In my own assessment, this entire discussion is a bit of a tempest in a teapot. Doom just used a term ("literal") in a particular way following a particular, even if ancient (and largely sectarian), school of thought. The way he used the term is decidedly not how it is used in popular speech, and so CC's defense, on one hand correct, is overstated when claiming that DD's usage has "never" been the held. DD's use is, in fact, the popular use, even if it isn't the on that either modern linguistics or classical philosophers use. I find myself in exactly the same place when I use words like "potentiality" or "final cause" in philosophical discussions. I'm using such words in a particular way, and if someone complains I'm using the word in the wrong way, it's my role to simply point out the tradition in which I am using them and in what words they ought to understand my meaning. The conversation about whether or not the word is "right" or "wrong" is entirely beside the point. Here is a picture of a very cute kitten. It is, by far, the most important thing posted in this entire thread, and it should make everyone feel better. 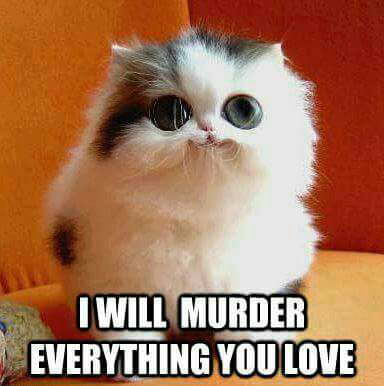 And here is another picture of a cute kitten with a funny (because of it's incongruence) text included. The second pic is literally captivating. I prefer puppies. Let the contention continue. I am scared of cats and dogs. What happened is that he used the word in a way you didn't expect. That doesn't make it wrong. That means you can ask for an explanation, say, "Oh, okay, I wasn't expecting that, but I see what you mean," and move along. For example, if I say 'you are pulling my leg', the literal interpretation of this expression is 'you are teasing me or telling me a joke', however, if you think it means that I am accusing you of grabbing one of my appendages, you aren't being literal, you are being literalistic. Ask any English teacher. To refuse to acknowledge that it is wrong is verging on gaslighting, but I have enough knowledge of the English language not to be misled. Could we try it a fifth? Always enjoy quoting myself. But I have to consider the source. Upon reflection, those puppies literally melted my heart.